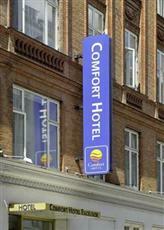 The hotel is located 100 meters away from The Central Station, Tivoli, City Town Hall and the main shopping street. The hotel is only 20 minutes from Bella Center, 25 minutes from the airport by train and 45 minutes from Malmoe city center. It has 99 spacious and beautifully furnished rooms with an en suite bathroom, safe, direct - dial telephone, cable TV and in-room movies. When staying at Comfort Hotel Excelsior, you have every opportunity to experience the authentic Copenhagen which offers an abundance of restaurants, museums, sights and sounds. Enjoy the intimate atmosphere in our cozy and sunny backyard, relaxing after an eventful day. Or perhaps you want to stay in our lounge while enjoying a free cup of coffee or tea. Other amenities and services include guest laundry facilities, elevator, multilingual staff, news stand, free wireless Internet access, conference room that accommodates up to 14 people, and a currency exchange facility.